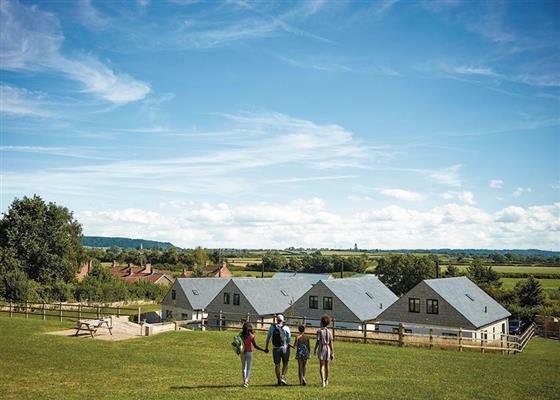 Windmill Retreat in Glastonbury sleeps between 2 and 8 people, with the accommodation being apartments and cottages. 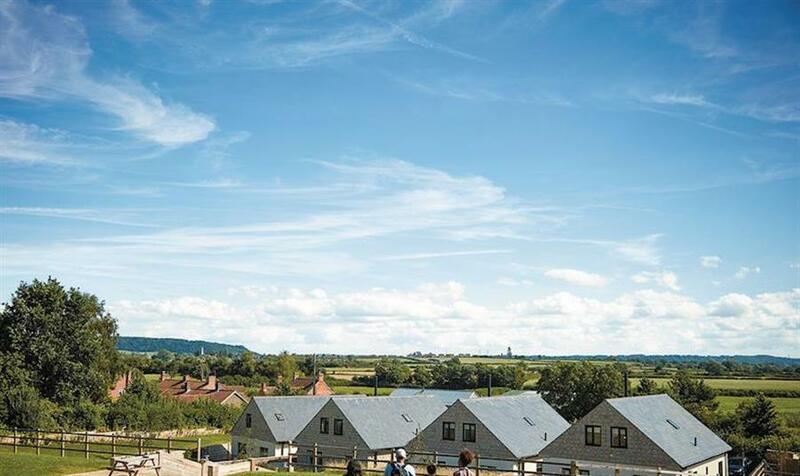 Windmill Retreat in Glastonbury, Somerset are a collection of lodges with cutting-edge design and contemporary luxury, which have a truly enviable setting in the heart of the spectacular Somerset countryside. Striking a sumptuous balance between home comforts and super-chic country living, each of these exquisite cottages boasts an individual interior that beautifully complements their magnificent position. Relax in a spacious executive apartment or curl up with a cosy wood burner in a cottage and indulge in balconies and bubbling hot tubs that bring the outside in – perfect for romantic rural retreats, revitalising escapes and blissful breaks with family and friends. This jewel in England’s crown sees picture postcard villages jostle with Exmoor, Dartmoor and the Somerset Levels. Cheddar Gorge, enchanting Wells and the coast are all easily accessible. Welcome pack including local produce, tea, coffee, milk, sugar, homemade cakes, local ale and cider. Many of the lodges at Windmill Retreat in Glastonbury, Somerset have their own private hot tub - so after a day exploring the mystical delights of Glastonbury, you can spend the evening in your own hot tub! If you want to find out what other people have said about Windmill Retreat, read the reviews on Windmill Retreat for more information. And, for those last minute bargains, have a look at some of the special offers available at Windmill Retreat. "Outstanding and beautifully presented first floor apartment. One king size double. Luxurious wet room with waterfall shower. Stylish well equipped kitchen with open plan living area with 50"" Smart TV and French doors leading onto balcony with glorious views over the countryside. Perfect for a romantic retreat. No pets." "Modern and spacious ground floor apartment. One super king size double (or twin by arrangement) and one double. Luxurious wet room with waterfall shower and additional handrails. Well equipped kitchen with open plan living area with 50"" Smart TV and French doors leading to small lawned garden. A perfect location for a couple or family looking for a memorable holiday experience." "Luxuriously modern and spacious two storey cottage. Ground floor: Two king size doubles, one with patio doors and ensuite bath with overhead shower, and one with ensuite shower. One double and one twin (double by arrangement). Bathroom with waterfall shower. First Floor: Modern Well equipped kitchen with open plan living area with 50"" Smart TV, wood burner and French doors leading onto balcony with fantastic views over the countryside. Outdoor hot tub with garden and furniture. Perfect for couples or families looking for a relaxing retreat. No pets." 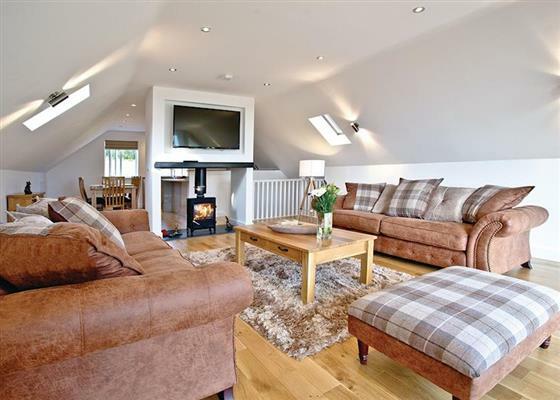 "The ultimate spacious and modern two storey cottage. Ground floor: Two king size doubles, one with patio doors and ensuite bath with overhead shower, and one with ensuite shower. One double and one twin (double by arrangement). Bathroom with waterfall shower. First floor: Modern well equipped kitchen with open plan living area with 50"" Smart TV, wood burner and French doors leading out onto balcony with fantastic views over the countryside. Garden with outdoor hot tub. Ideal retreat for a holiday whatever the occasion. No pets." "Stylish and contemporary two storey cottage. Ground floor: Two king size doubles, one with patio doors and ensuite bath with overhead shower, and one with ensuite shower. One double and one twin (double by arrangement). Bathroom with waterfall shower. First floor: Modern well equipped kitchen with open plan living area with 50"" Smart TV, wood burner and French doors leading onto balcony with glorious views over the countryside. Garden with outdoor hot tub. A haven of tranquility awaits. No pets." Find out about Windmill Retreat, including prices and availability. There aren't currently any special offers at Windmill Retreat however, the special offers shown below are all on parks within 30 miles of Windmill Retreat - so you may find these useful. Holiday at Clifton Elegance Lodge 3 in Somerset starting on Saturday 27 April 2019 for 7 nights. Holiday at Cheddar Lodge in Somerset starting on Saturday 27 April 2019 for 7 nights. Holiday at Axbridge Lodge Premier in Somerset starting on Saturday 27 April 2019 for 7 nights. Holiday at Cheddar Lodge Premier in Somerset starting on Saturday 27 April 2019 for 7 nights. Holiday at Pemberley Watersedge Lodge in Avon starting on Saturday 04 May 2019 for 7 nights. Holiday at Newton Brook Elegance Lodge in Avon starting on Saturday 04 May 2019 for 7 nights. Holiday at Exmoor Gate Lodge in Somerset starting on Saturday 11 May 2019 for 7 nights. Holiday at Pemberley Watersedge Lodge in Avon starting on Saturday 11 May 2019 for 7 nights. Holiday at Newton Brook Elegance Lodge in Avon starting on Saturday 11 May 2019 for 7 nights. Holiday at Burnham Deluxe 3 (Sat) in Somerset starting on Saturday 18 May 2019 for 7 nights. Holiday at Burnham Prestige 3 (Sat) in Somerset starting on Saturday 18 May 2019 for 7 nights. Holiday at Exmoor Gate Lodge in Somerset starting on Saturday 18 May 2019 for 7 nights. Holiday at Exmoor Gate Lodge in Somerset starting on Saturday 25 May 2019 for 7 nights. Holiday at Mendip View Luxury in Somerset starting on Saturday 25 May 2019 for 7 nights. Holiday at SG 1 Bed Value Chalet in Somerset starting on Saturday 20 July 2019 for 7 nights. Holiday at SG 2 Bed Value Chalet in Somerset starting on Saturday 20 July 2019 for 7 nights. Holiday at SG 2 Bed Value Chalet (Pet) in Somerset starting on Saturday 20 July 2019 for 7 nights. Holiday at SG 2 Bed Bronze Caravan (Pet) in Somerset starting on Saturday 20 July 2019 for 7 nights. Holiday at SM 3 Bed Gold Lodge in Somerset starting on Saturday 20 July 2019 for 7 nights. Holiday at SM 3 Bed Gold Lodge in Somerset starting on Saturday 27 July 2019 for 7 nights. Holiday at SM 3 Bed Platinum Lodge in Somerset starting on Saturday 27 July 2019 for 7 nights. Holiday at SM 3 Bed Gold Lodge in Somerset starting on Saturday 03 August 2019 for 7 nights. There are 196 holiday parks within 15 miles of Windmill Retreat. The Barn by The Lake in Brompton Regis, Somerset, and sleeps 5 people. 25 miles. The Teachers Cottage in Bath, Gloucestershire. 36 miles. The Coach House in Dulverton, Somerset. 23 miles. Ashton Mill Cottage in Steeple Ashton, Wiltshire. 38 miles. Lilac Place in Colyton, Devon, and sleeps 6 people. 25 miles. Mannings Mead in Bath, Avon, and sleeps 9 people. 26 miles. Pear Tree Cottage in Bishops Nympton, Devon. 38 miles. Broadmead House in Beaminster, Dorset, and sleeps 14 people. 19 miles. Victoria Lodge in Lynton, Devon, and sleeps 12 people. 42 miles. Threshing Farm in Barnstaple, Devon. 47 miles. The Toll House in Minehead, Somerset, and sleeps 4 people. 24 miles. Longbridge Cottage in Shepton Mallet, Somerset, and sleeps 2 people. 17 miles. Weavers Corner in Evercreech, Somerset, and sleeps 5 people. 18 miles. Hillview in Bridport, Dorset, and sleeps 4 people. 23 miles. Tor View in Glastonbury, Somerset, and sleeps 5 people. 8 miles. Meadow Wood in Bishops Lydeard, Somerset, and sleeps 12 people. 13 miles. Coastguard Cottage in Wareham, Dorset, and sleeps 7 people. 43 miles. The Granary in Wickwar, Gloucestershire, and sleeps 5 people. 41 miles. Newcourt Barn in Exeter, Devon, and sleeps 5 people. 32 miles. Culbone Parsonage in Porlock, Somerset, and sleeps 6 people. 34 miles. Ridgefield House in Longdown, Devon, and sleeps 8 people. 41 miles. Dovecote Barn in Tetbury, Gloucestershire, and sleeps 8 people. 48 miles. Canute Cottage in Portland, Dorset, and sleeps 5 people. 42 miles. Wallflower Cottage in South Petherton, Somerset. 11 miles. Anchor Cottage in Weymouth, Dorset. 40 miles. Purcombe Farmhouse in Bridport, Dorset, and sleeps 12 people. 23 miles. Little Owl Barn in Wellington, Somerset, and sleeps 4 people. 17 miles. 17th Century Castle in Clevedon, Somerset, and sleeps 16 people. 25 miles. Christmas Cottage in Chulmleigh, Devon, and sleeps 6 people. 49 miles. Kirby in Minehead, Somerset. 31 miles. Smokeacre Farm Cottage in Yeovil, Somerset, and sleeps 2 people. 14 miles. The Bakehouse in Bridport, Dorset, and sleeps 4 people. 22 miles. Hollyhock House in Salisbury, Wiltshire, and sleeps 6 people. 49 miles. Corner Cottage in Chagford, Devon, and sleeps 6 people. 49 miles. Colts Close Stables in Wool, Dorset, and sleeps 4 people. 40 miles. Leam House in Portland, Dorset, and sleeps 8 people. 43 miles. Larkhall Square in Bath, Somerset, and sleeps 6 people. 32 miles. Oaklands in Lynmouth, Devon, and sleeps 12 people. 39 miles. Colts Close Cottage in Wool, Dorset, and sleeps 8 people. 40 miles. Breaches Barn at West Park Farm in Fordingbridge, Hampshire, and sleeps 11 people. 48 miles. Five Bells in Axminster, Devon, and sleeps 5 people. 18 miles. Seagers Cottage in Wareham, Dorset, and sleeps 8 people. 49 miles. Comedy Stables in Malmesbury, Wiltshire, and sleeps 2 people. 47 miles. Bow Bridge Cottage in Ilminster, Somerset, and sleeps 4 people. 10 miles. Barrowswood Lodge in Cheddar, Somerset, and sleeps 8 people. 14 miles. Higher Westcott Farm in Moretonhampstead, Devon, and sleeps 12 people. 46 miles. Dunley Farmhouse in Newton Abbot, Devon, and sleeps 11 people. 47 miles. Woodmans Stoup in Colyton, Devon, and sleeps 10 people. 26 miles. Durdle Door Holiday Cottages in West Lulworth, Dorset. 42 miles. The Victorian Barn and Dairy House Farm Cottages in Blandford Forum, Dorset. 29 miles. West Park Farm in Fordingbridge, Hampshire. 48 miles. The Dower House in Charmouth, Dorset, and sleeps 18 people. 24 miles. Boshill House in Lyme Regis, Dorset, and sleeps 14 people. 26 miles. Peppers Lodge in Cheddar, Somerset, and sleeps 4 people. 13 miles. Pennsylvania Castle in Portland, Dorset, and sleeps 20 people. 43 miles. Lymelight in Lyme Regis, Dorset, and sleeps 8 people. 25 miles. Harbourside Cottage in Minehead, Somerset, and sleeps 8 people. 20 miles. WhileAway Lodge in Cheddar, Somerset, and sleeps 4 people. 13 miles. Quakers in Membury, Devon, and sleeps 4 people. 20 miles. The Wookey House in Wells, Somerset. 14 miles. Munty Cottage in Taunton, Somerset, and sleeps 4 people. 16 miles. Forest Perch House in Lynmouth, Devon, and sleeps 22 people. 41 miles. Dippers Folly at Jeffries Mill Cottages in Frome, Somerset, and sleeps 4 people. 27 miles. The Old House in Exeter, Devon, and sleeps 14 people. 45 miles. The Gate House in Wimborne Minster, Dorset, and sleeps 14 people. 45 miles. The Linhay at East Dunster Deer Farm in Tiverton, Devon, and sleeps 12 people. 33 miles. Fossilers Lodge in Lyme Regis, Dorset, and sleeps 8 people. 25 miles. Drewstone Farm Cottages in South Molton, Devon, and sleeps 6 people. 39 miles. Bucks Cottage in Glastonbury, Somerset, and sleeps 12 people. 12 miles. The Piglet in Sidbury, Devon, and sleeps 2 people. 29 miles. The Old Reading Room in Langton Herring, Dorset, and sleeps 5 people. 35 miles. Advantage Point in West Lulworth, Dorset, and sleeps 10 people. 43 miles. Castle Hill House in Sidbury, Devon, and sleeps 12 people. 29 miles. Huxham View in Exeter, Devon, and sleeps 16 people. 35 miles. The Skilling in Bridport, Dorset, and sleeps 13 people. 26 miles. The School House in Countisbury, Devon, and sleeps 13 people. 38 miles. The Grange at Grange Estate in Simonsbath, Somerset, and sleeps 16 people. 38 miles.